Beer club beer of the week, this time it’s Behemoth “Hopped Up On Pils” I’ve had this from the keg previously, and came away underwhelmed, but I might have been uninformed. Anyway lets go again. A 330ml bottle of a 5% ABV beer, being 30 IBU things, and in total 150 calories in this serve size, and that all makes about 1.3 standard drink units. 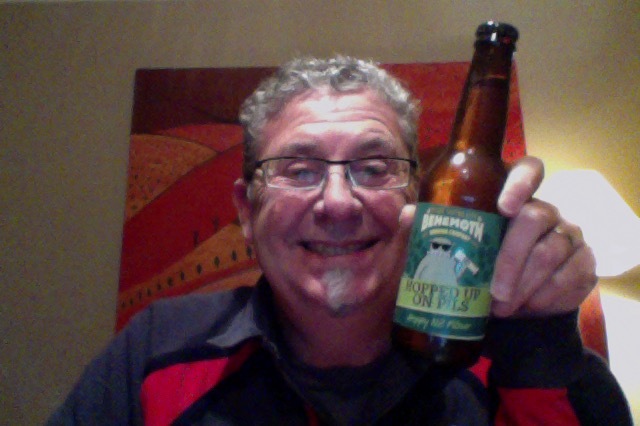 Brewed at Behemoth Brewing Company in the style this is of Pilsener and they are in, mysteriously, New Zealand, no town, just “NZ”. NZ Pilsner with big NZ flavour and aroma without massive bitterness. Dry hopped like an IPA. What could go wrong with what? It’s very hoppy on opening, just the hop aroma, an understated sweetness, does not have that tang of an IPA for instance. Pour is a very pale yellow beer with the most magnificent white head, it looks amazing. The taste is less sweet than I remember, this has a flat unmistakable hop presence that finishes sharply dry. Leaves a lovely lacing in the glass as you sip. I’m also less enthusiastic on the flavours that this has than the last time I tried it, possibly, again, it’s too cold, and that’s stifling the notes. So a late dry hopped Pilsner. I guess it is what it is, and again I find myself betwixt and between on this. I like a Pilsner, and the idea of a hopped up version appeals. For me though this is carrying just a lot of front end dry heaviness not adding flavour, just presence. Which is disappointing. When you do get the flavour notes they’re really clean, and almost fruity in their way. This isn’t a sweet or quaffable beer though, and is best enjoyed at sipping or conversational pace. It really would be an ideal beer to have with a food. Which I didn’t think to organise, as usual. The pdubyah-o-meter rates this as 7 a of its things from the thing. It’s refreshing, it’s nice, but it isn’t sparking on the palate with flavours and tastes, so overall it’s not for me. I get the late dry hopped thing, I see what it did and how it worked, it’s interesting and makes this a unique take on the Pilsner style. Sometimes though different isn’t better. However if I was out and this was on then I’d be in. Am I enjoying it? As a Pilsner not really, as a twisted pilsner a lot more. Would I have another? I would, there is nothing that says stay away, it’s nice drinking, but I’d have to be in the mood. Would I share with a friend on a porch and set the world to rights? I would because I think you could begin to talk about cross-over beers between styles. It’s quite clever. 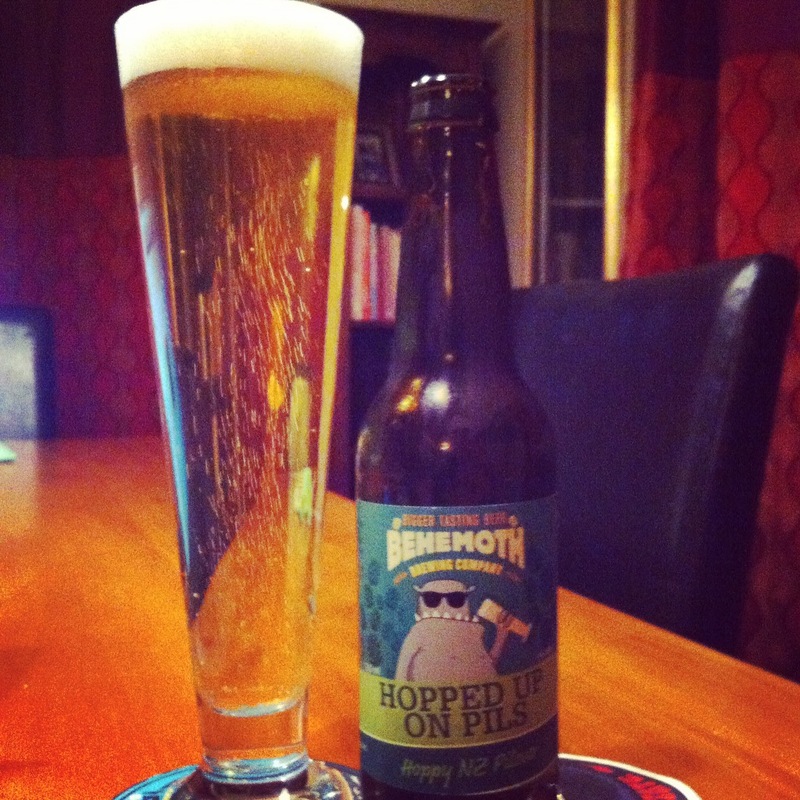 This entry was posted on July 23, 2015 by Philip Walter in Beer, Beer of New Zealand, Beer Review, Behemoth, Craft Beer, Critic, Pilsener and tagged Alcohol by volume, Beer, Behemoth Brewing, Behemoth Hopped Up On Pils, craft beer, Hopped Up On Pils, Pilsner.